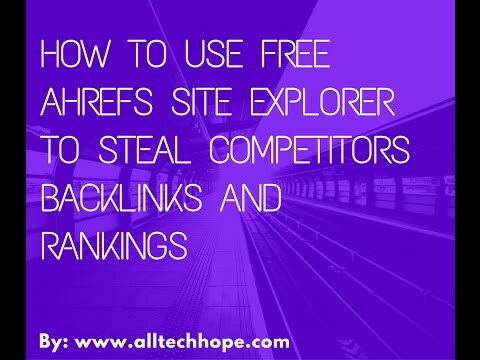 How To use Free Ahrefs Site Explorer to Steal Your Competitor Backlinks and Rankings !! Ahrefs is the best tool to create and check Backlinks for your site or clients. Most of the people stopped using Ahrefs since it became much expensive. But, guess what, if you are a newbie Blogger and thinks like I don’t have enough money to spend it on the tools. Then, today I will teach you how to use Ahrefs to Steal Your Competitors Backlinks, Keywords to Improve the rankings of your site!! Creating Backlinks the old school and most efficient method until now to Improve SERP of any website. But, most of the people doing it wrong by building too many backlinks to the site from the exact same domain. Confused, I will tell it clearly! and your competitor site has only ten backlinks from 10 different domains like ex1.com…ex10.com. Then, who will win the battle, Your competitor, So, instead of focusing on some backlinks focus on number os Referring Domains ( RD)? Today in this video you will learn how to build backlinks. I am just showing the way to do it. You need to be safe yourself by selecting the right domain ( relevant ) domain to avoid Google Penalty. So, Do read all this content carefully before doing something like this !!! And I would like to thank Tim Soulo for creating such an awesome tool! !